Things I've Found In Pockets: Christmas Spirit! 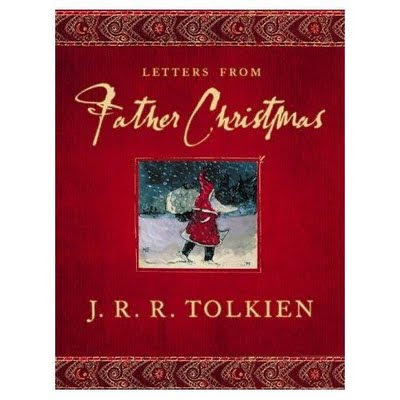 And A Review: Tolkien's "Letters From Father Christmas"
Christmas Spirit! And A Review: Tolkien's "Letters From Father Christmas"
Last year, Chas (Eldest Boy) finally asked the question: "It's really you and dad, isn't it? I mean. I know. I've just been pretending." "Yes. Don't spoil it for your brothers." "Gasp! I WOULDN'T!" And so Chasbo joined Sean and I in the best fib of them all. Last week, we started reading J R R Tolkien's "Letters From Santa", a beautiful collection spanning some twenty years, from the first notes to his eldest son to the last poignant poetry to Tolkien's daughter and youngest child. The letters manage to be heartbreaking, with each child eventually becoming too old for a stocking "...but I don't forget people even when they are past stocking-age, not until they forget me..."; terribly exciting, with battles and goblins who almost ruin Christmas; hilarious, as the cast of characters gradually expands and we meet the other inhabitants of the North Pole. Chas feels himself much too old for storytime these days. He curls up in his own bed with his own more grown-up book, and seldom comes to snuggle anymore. But when I started to read Tolkien's enchanting writing, he crept over and we all made room. Max said "But it says "Tolkien" on the front! Is this real?" Sam looked like he was wondering the same thing, but was afraid to ask. He is strenuously avoiding the Question, since he is not yet ready for the Answer. "It's COLLECTED by Tolkien, see?" explained Chas. "Come ON, does that writing sound like Tolkien's?" "Sounds like Santa to me" I agreed. Max was happy with that. He BELIEVES in Santa. Sam looked relieved, and snuggled closer. Since then, every night, we all read through a few years. Photos of Tolkien's (Santa's, sorry) original letters and drawings are there, with notes from the North Polar Bear in the margins. I have read ahead, and finished the book myself. I had to. I will be very sorry to reach the end with the kids, it has been lovely to have them ALL so snuggly at bedtime! This is a must-read for anyone who has ever believed in Santa, or would have liked to. For reading aloud, read Santa in your normal voice so that you can give Polar Bear a really gruff deep voice. He interrupts all the time, and you'll need a very different sound to differentiate them! Oh, and don't save this one for Christmas Day: Read it now. hmmmmm...my 11.5 year old is uncertain right now. It shows in her politically correct letter to Santa this year. Last year her 16 year old cousin got coal in his stocking (my sister can be oh so cruelly comical sometimes) so his 12 year old sister and my girls are taking no chances this year in questioning the existance of the Big S.
*GASP* Actual COAL?!?! Oh my goodness!! LOL! p.s. Christmas morn 2007... along comes me and the 6.5 year old pressed to my back tiptoeing down the stairs to peek and see if Santa has been and gone. At precisely the same moment one of the dogs decided to drag his collar on the ground outside (it's a dachshund okay, they do these things). It made a lovely tinkling sound and then stopped (he probably swallowed it). The kid and I looked at each other, gasped, and ran back up the stairs and under the sheets. Santa was still around! It was not safe to go poking around as yet! As big a fan as I am of Tolkien's, I have never known, until now, that this book existed. I'm hoping Father Christmas will be kind enough to drop this in my stocking, this year. p.s. I watched an all day marathon of the three Lord Of The Rings movies yesterday. Coincidence? I think not. oooh, I'm going to look for that book at the library. I love reading Christmas books to the boys. And my 8 year old does the same thing. He says he doesn't want to listen, but then comes and snuggles with us once we start reading. Love it. what a sweet story. Truly adorable. must look for that book! Oh...I need this book. NEED it now. I think it must have just come out this year? I've never seen it before. Just got a great idea for another present for Kahlil and Kamala. Thanks! Kamala had books as her ONLY present request. Love that girl! Wait a minute.. What are you alluding to? He is real, isn't he? heh heh...and as for Master Sam, he is one clever little bugger isn't he, the boy who knows when to stay quiet! Yup, Sam knows that Santa = presents. He's not taking any risks! Nan...emailing you a priceless photo of Mikey inspecting the 'reindeer tracks' in our kitchen from a couple years ago..it is one of my fav. photos of the kids..please post it here..wish I could. That's awesome! Did you know you can get a Letter From Santa Claus sent to your child? There are some adorable ones at Original Santa Mail. They are really fun and whimsical for kids but also have a special message for kids about being thankful and kind. My daughter got one and didn't set it down for days! 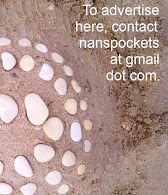 Try googling Original Santa Mail! So cute. So cool! I've never heard of that book. I want it! Nan!!! Can't find the pic!! But I will!!!! i love it. merry christmas from us to you.